On Saturday, 10/04, it was the PokerChip Race finals organized within the Winamax Open Day. 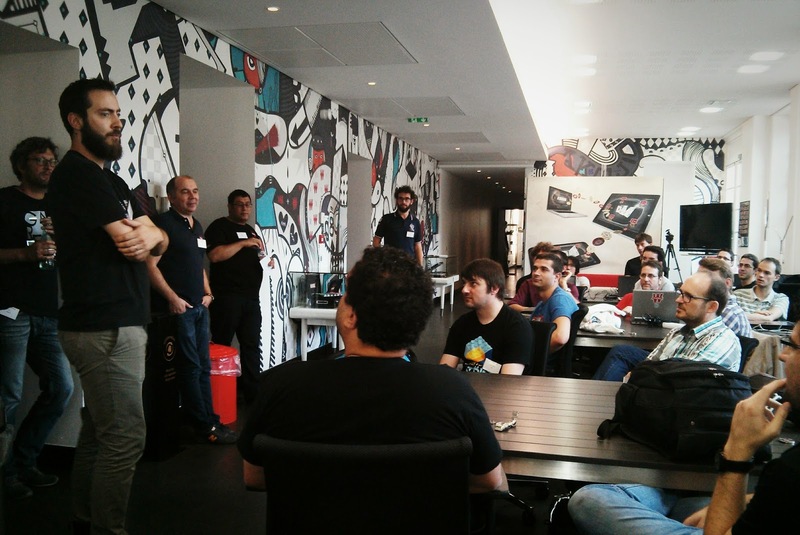 Hosted in Winamax's beautiful office in the heart of Paris, the event started at 10:45. We were welcomed by the Winamax staff with a very nice café-croissants breakfast. 26 finalists had made the journey from the four corners of France (Marseille, Rennes, Nantes, Lyon, etc.). Let me tell you they were all determined to improve their AI to top the podium (or keep their rank on the podium, cf. Xylo ;-) ). 11:30 am: Winamax founders Alexandre Roos and Christophe Schaming introduced the company, followed by a presentation of the R&D team who was there too to welcome the CodinGamers. At noon, everyone was ready to code for the finals that would last for 4 hours. As a surprise, a new rule was announced: this time, the "walls" fell. As the afternoon went on, the rankings evolved a lot but the atmosphere stayed great and relaxed, with unlimited beers and an Italian buffet. Everyone had time to take breaks in the gardens outside, to enjoy the sun and socialize. 16:00: a new surprise rule was announced! From there on, the finalists had to code without either being able to see their ranking or play any matches. Some chose to throw in the towel and decided to trust their fate. Others held on and still coded (which would reveal to be rewarding for some of them especially Xylo and Pirquessa). 1 hour and 20 minutes of rankings calculations later, the final Leaderboard was displayed on a large screen. It was Manwe who finished first, and won an Iphone 6. He was followed by Pirquessa who took his revenge and got an Ipad Retina. And last but not least, Xylo climbed from 5th place to 3rd less than one second before the end, and he won a Winamax poker case. Overall, it was a great Open Day. Fred and I were really pleased, as always, to meet and chat live with the CodinGamers. We could announce a few scoops (yes :), enjoy Winamax staff's warm welcome and their wonderful organization (thanks Catherine, thanks Julien! ).